Working with marginalised people is hard work. I guess that, if it were easy, they wouldn’t be marginalised and more people would be happy to work alongside them! Here in Ranong, Thailand, Marist Mission Ranong (MMR) has created an ethos born out of the Marist charism, to educate and care for the neglected and downtrodden, essentially, to see a need and to act on it, fulfilling Christ’s invitation to be his hands and feet. 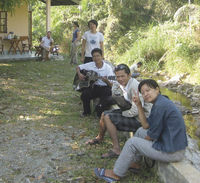 The physical home of the Marist community in Ranong where the core members of the community live is Marist house. This is also where the staff and volunteers gather with the community for evening meals, for prayer and a weekly volunteers’ Mass. I’m a fan of community living. It seems to answer many of the challenges that one is confronted with when trying to address the needs of unwanted and unloved peoples. Even though we don’t all live together, this community shares a hope for the Burmese migrants in Ranong. Some of the staff are Thai, some Burmese. This in itself is enough to highlight the importance of this non-governmental organisation. Many Thai resent having to share this small city with five times their own number of Burmese migrants. 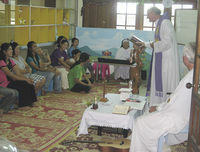 A Catholic community in a Buddhist country also affects the dynamic here. The community maintains a prayer house, half an hour away in the hills which affords a place for solitude. 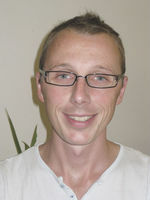 We have received a retreat day there, delivered by Fr Chris Skinner. This house is a visible sign of this Catholic community’s commitment to prayer which goes some way towards meaningful dialogue with the local Buddhist monks. I have heard of community living as a harder way to live – having to put up with people’s annoying habits and idiosyncrasies, at work and when you get home. Through this challenge, a community’s individuals commit to sacrificially loving and serving one another. A community with a purpose (that of serving others in a challenging context) ensures a common direction and resolve to its daily living. It also provides a loving and supportive family environment in which to work, rest and pray. There is much to do here but the willingness to serve each other means that there are rarely any major issues. The desire to serve, but also celebrate, echoes a simplicity that can often be lost in modern living. In community there is also less focus on oneself but more focus on the bigger picture, of which I am but a small part. It seems to liberate everyone involved from too much stress and overwork, but also the inverse – laziness and tardiness. This Marist community in Ranong is the spiritual backbone to an NGO that is doing amazing work with a large group of stigmatised and outcast people. The director of MMR, Fr John, reminded me also of the depth of understanding of what really matters here in this challenging context. This ensures that we don’t get too bogged down about whether what we are doing is making a difference. The community does its best knowing that being the smiling face, hands and feet of Christ is a privilege worth working hard for. Centre: Some of the MMR community at a retreat day at the Prayer House lead by Fr Chris Skinner. Julie (Health Nurse), Francis (Teacher), and Phillip (Seminarian) in the foreground with Mary-Grace Williams. In the background are Thibaut and Anna from the French NGO, Enfants Du Mekong. Bottom: Fr John Larsen (Director of MMR) and Fr Chris Skinner celebrating Burmese Mass in Ranong. Fr John gives a great homily in Burmese and Fr Chris gave a reflection on a couple of songs that he shared with us.